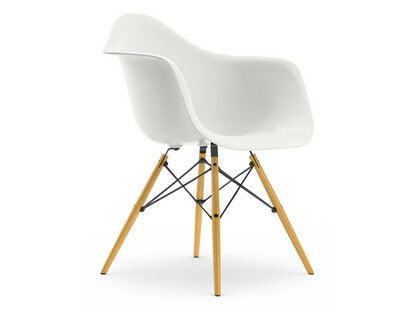 Charles and Ray Eames designed the DAW armchair in 1950 as part of a plastic chair collection. 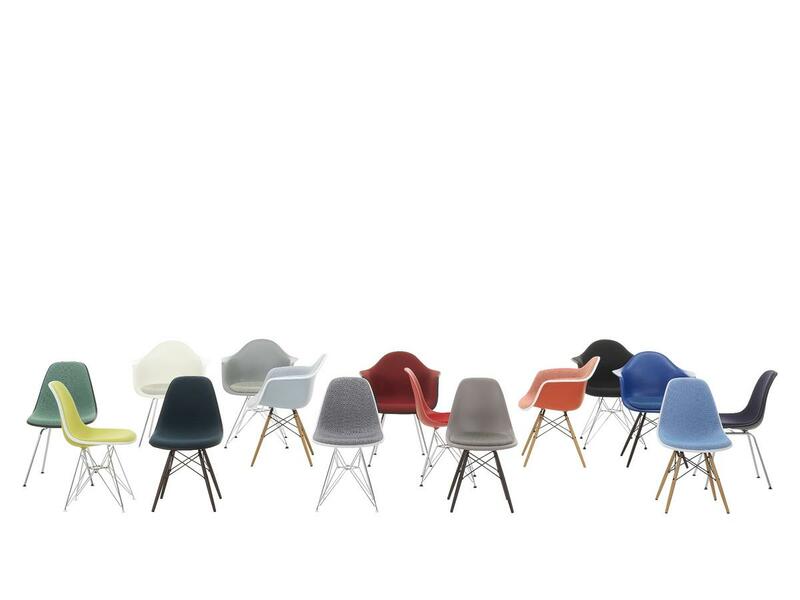 Produced by Vitra the Eames plastic chairs are the first serially produced plastic chairs in furniture history and are today available with various seats and frames, making them both multi-functional and multi-purpose. Progress being what it is, since Charles & Ray Eames created their plastic chairs in the 1950s, the average height of the average human has increased; consequently, Vitra have responded by adapting the design to meet the needs of contemporary customers and in cooperation with the Eames Office have increased the bases of chairs by 2 cm. Please note that wood is a natural material. Every base is unique and due to the influence of UV-radiation the colour pigments in the wood change during use. Care For cleaning the plastic elements always use a soft, damp cloth and a mild detergent. Dust and fluff can be vacuumed, marks are best treated with a soft, damp cloth and a mild detergent. Professional cleaning should be undertaken with the chair fully assembled and using upholstery foam or with a professional cleaning machine. Product datasheet Please click on the picture for detailed information (ca. 2,7 MB). 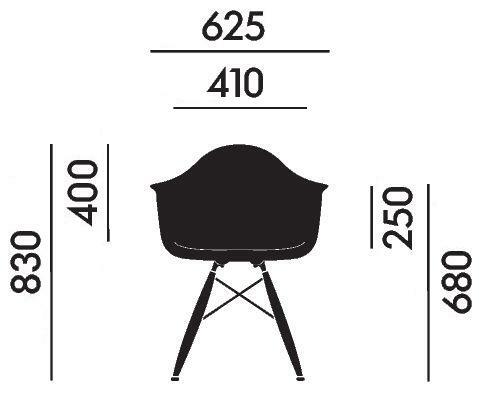 How much weight can the Eames Plastic Chairs support? 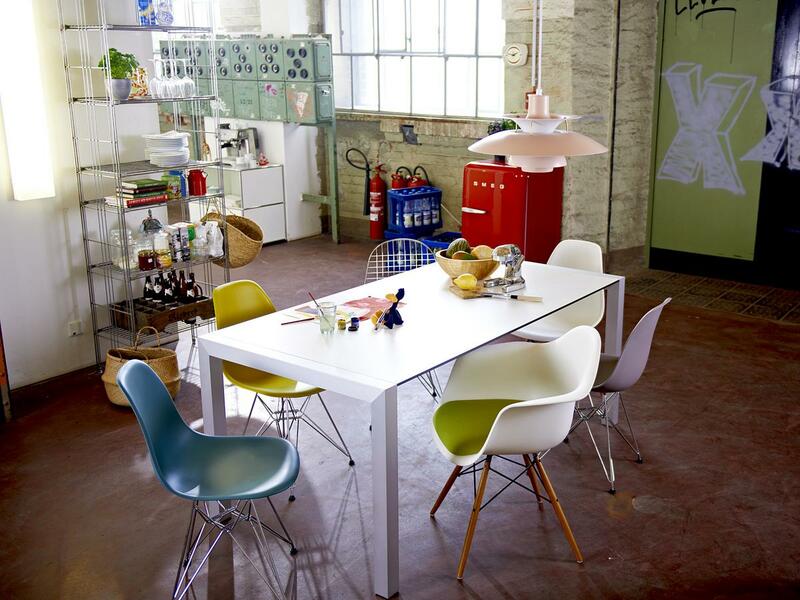 The Vitra Eames Plastic Chairs are tested to 110 kg and so meet the "GS" test standard. Just as important as the weight however are the users sitting habits. Swinging on the hind legs, for example, caused a very high load which can dramatically shorten the life. 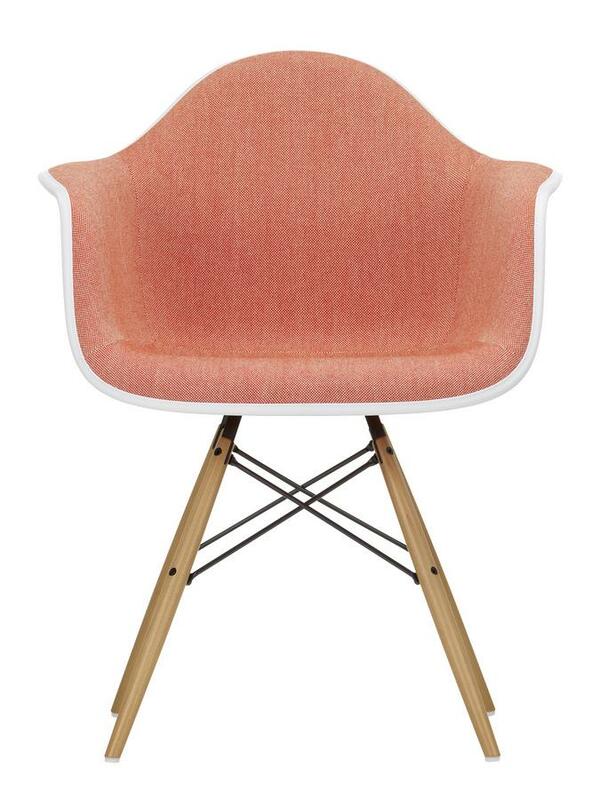 Can one add cushions to an unupholstered chair? The Hopsak seat cushions are bolted to the seat shell. 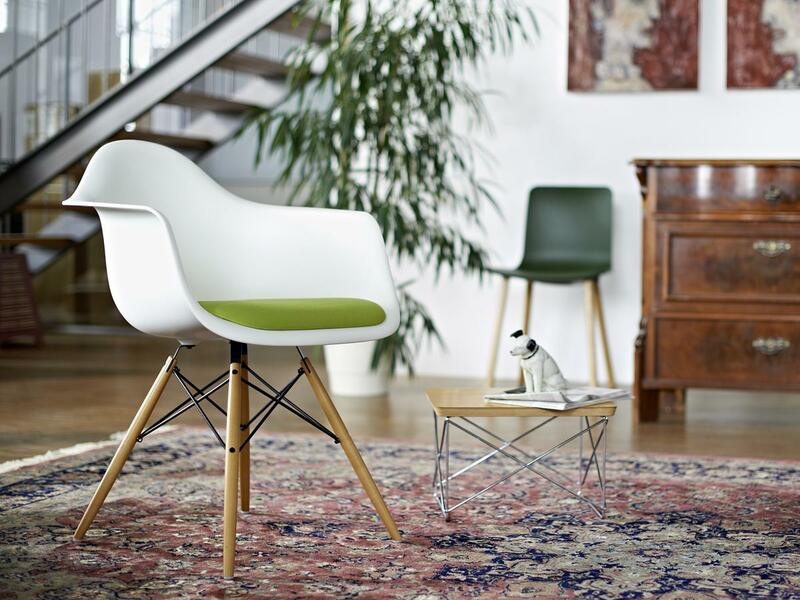 Separate seat cushions for the Eames Side Chairs and Armchairs can be ordered from Vitra; however, special tools are required for the retrofit of the seat cushion. As an alternatively we can offer felt seat cushions from Park House in different colours and with different levels of padding. Why is there a new seat height? 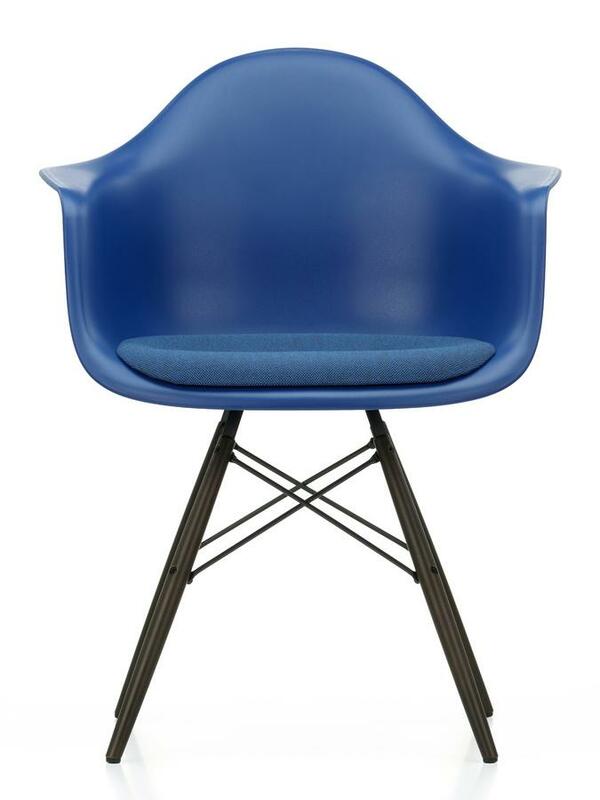 Since Charles and Ray Eames designed the chairs the average height of the population has grown by around 10 cm. 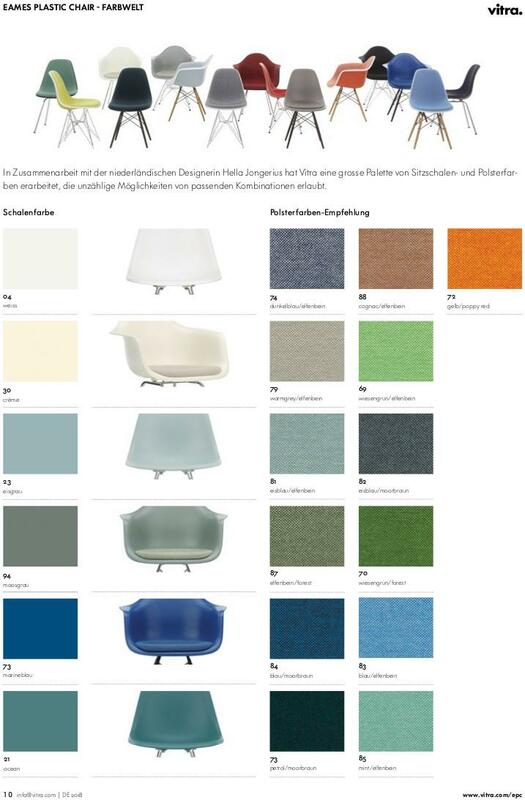 Therefore, in addition to adjusting the height of the Eames Lounge Chair in 2015, Vitra also adapted the Plastic Chairs (DSW/DAW, DSR/DAR, DSX/DAX) to better meet current user needs. The bases of the chairs are consequently now on average 2 cm higher. The change is minimal and accordingly can only be seen in direct comparison. Bases of the original height (41 cm) are still available as spare parts on request. Which wood colour are the legs? 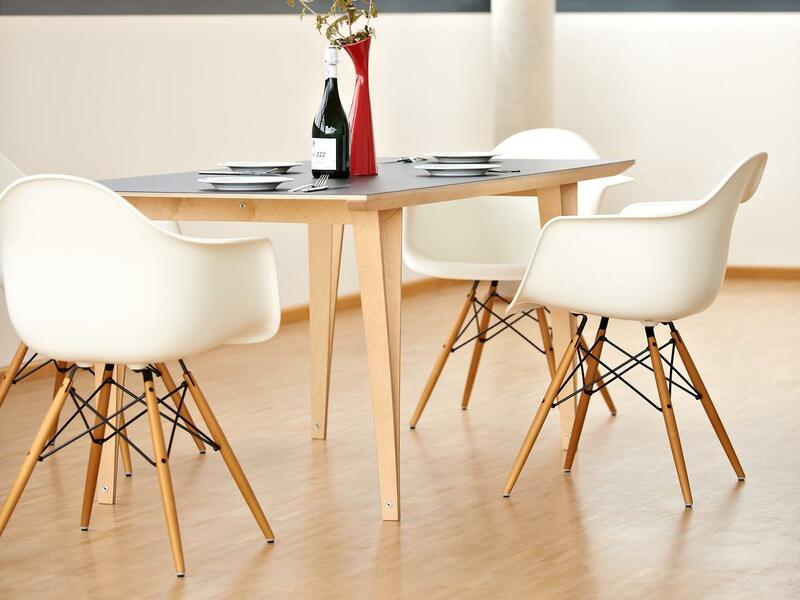 The wooden legs of the Vitra Eames DAW are stained maple. The old reddish stained version was produced until the end of 2008 and is no longer available. Since 2009 the maple wood has been stained yellow. 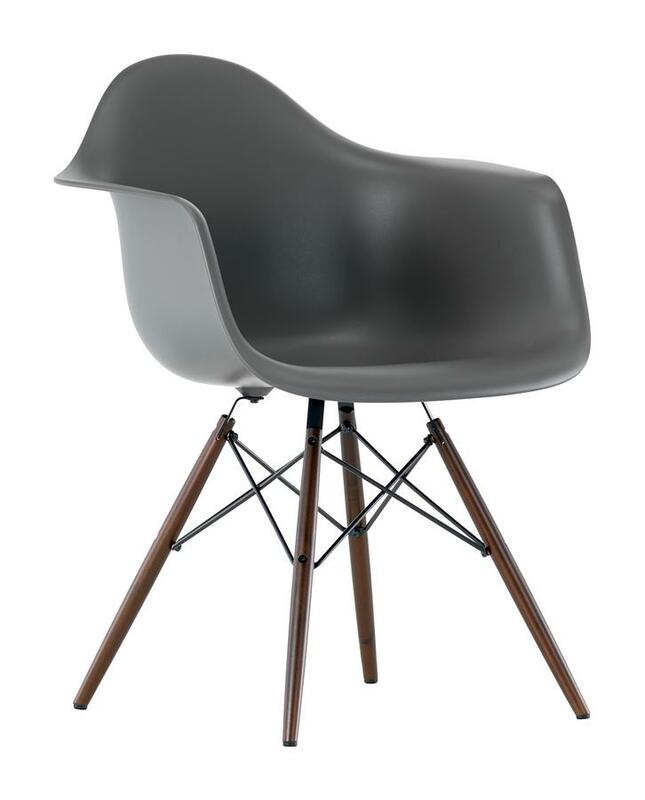 In 2013 Vitra also released dark maple and black maple versions and in 2016 added a honey stained ash version. How is the seat height measured? The seat height is determined according to the European standard EN 1335-1. This states that the chair be clamped in a special tester and loaded with a weight. The dimensions are then determined in the loaded state. The seat height being measured at a position defined by the standard and when in the load bearing state. 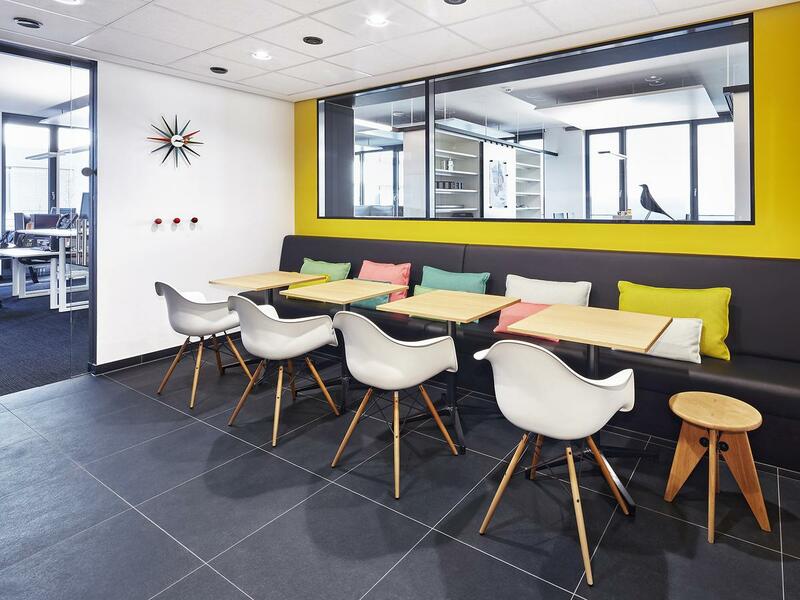 The stated seat height cannot be measured with a conventional measuring device, rather is a normalised comparison value so that different chairs (for example, with and without height adjustment, or with varying thickness of seat cushion, etc.) can be compared with one another. 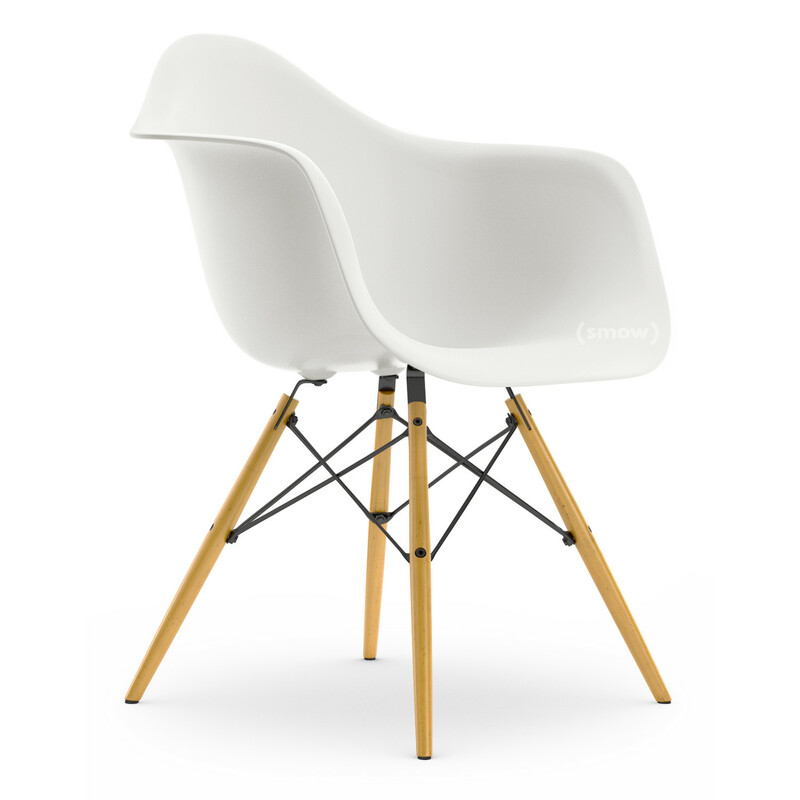 How do I recognise an original Eames Plastic Chair? 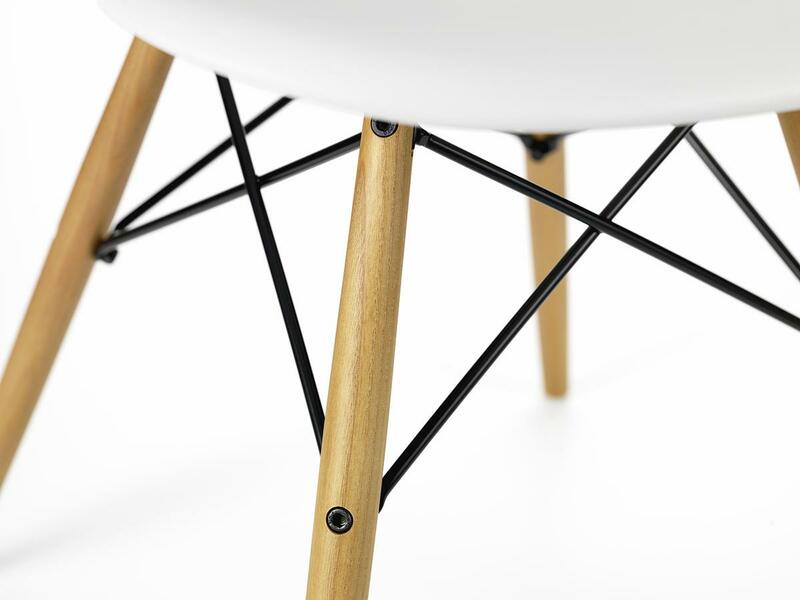 On the underside of the seat shell, the material marking PP indicates the polypropylene used for the shell, a seal certifies the safety of the chair and a sticker indicates the place of manufacture and serial number. 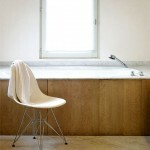 In addition, Vitra always supplies the original fully assembled. 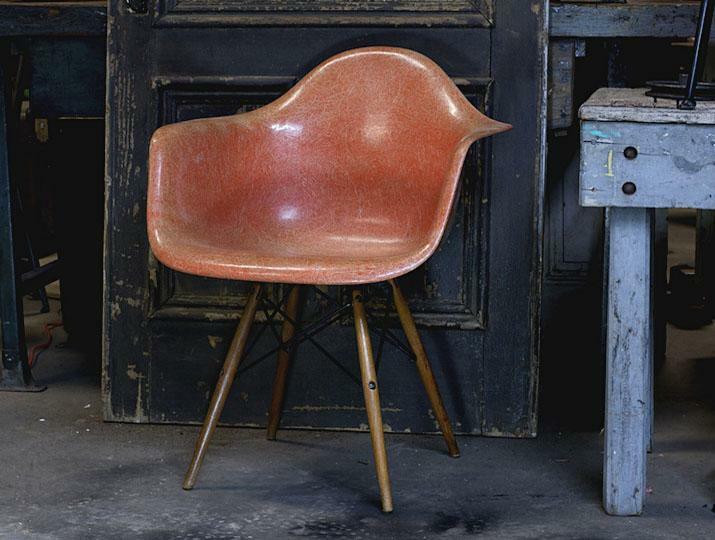 Through the establishment of new manufacturing processes and materials Charles and Ray Eames were responsible on more than on occassion for small revolutions in history of furniture design. 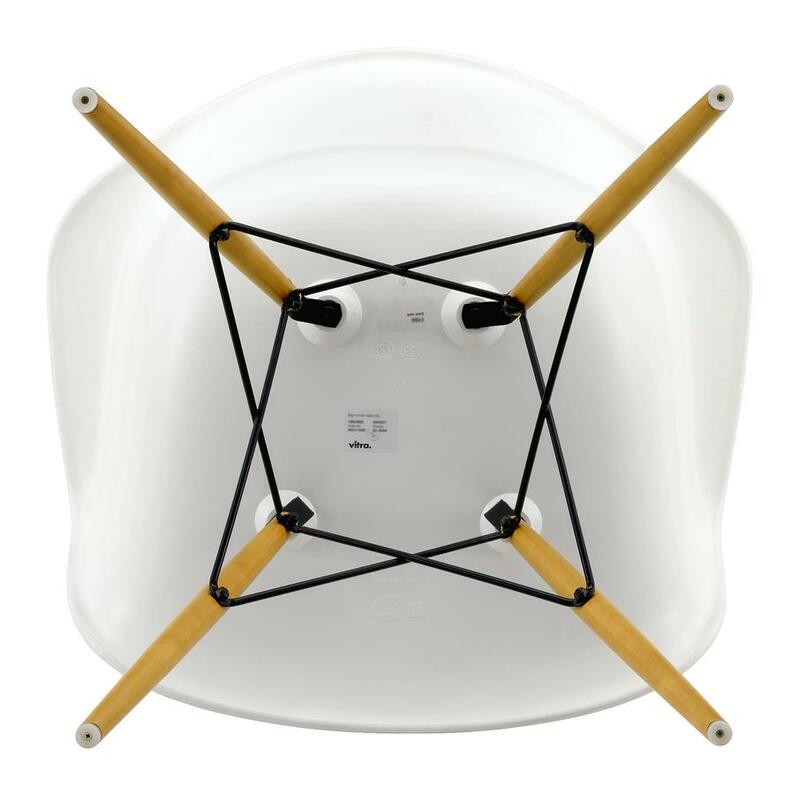 One such example is the Eames Plastic Chair Collection, a series of chairs originally developed for the Museum of Modern Art in New York's 1948 "International Competition for Low Cost Furniture" competition and which today can be found in all important museum collections. And untold homes. 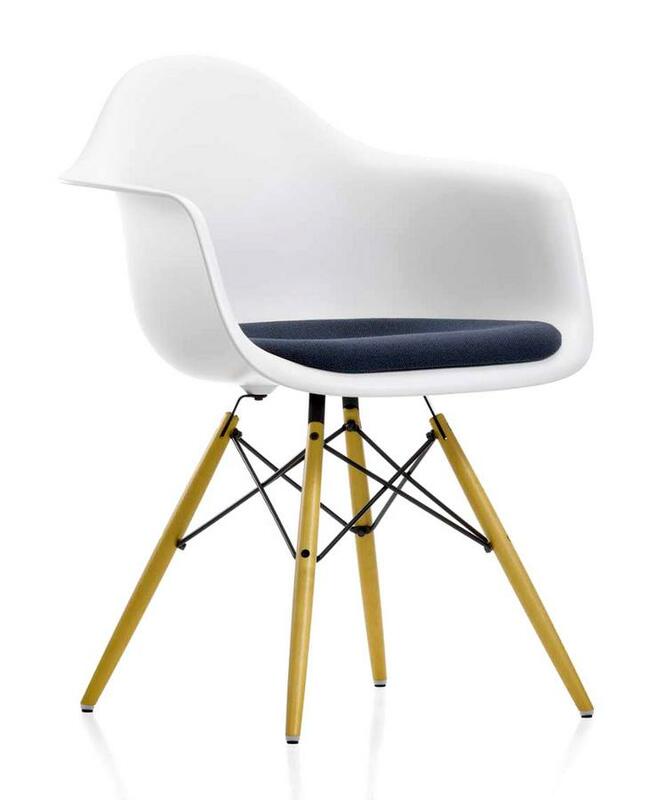 Created from the, then, new material of fibreglass Charles and Ray Eames achieved with their plastic armchairs and plastic side chairs affordable, mass producible chair that perfectly conformed to the spirit of late 1940s America. 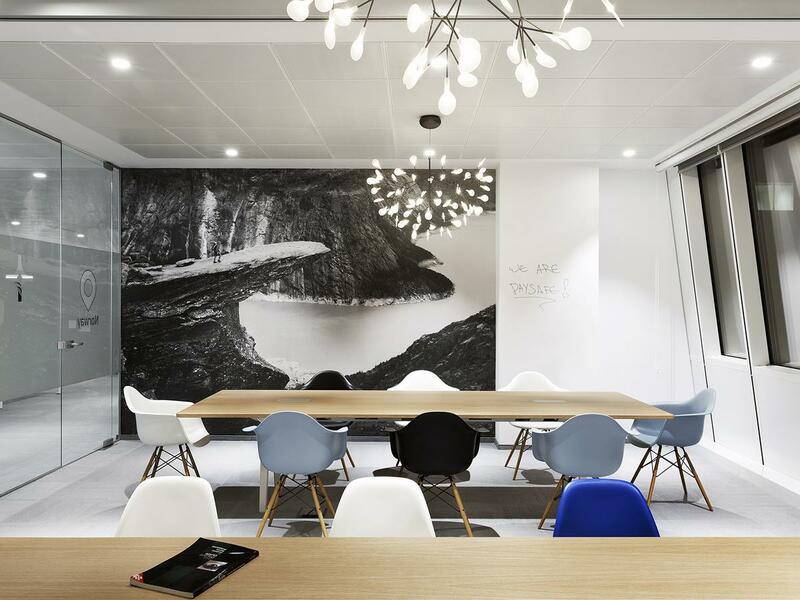 And chairs which eloquently meet Charles and Ray Eames central aim with heir designs, namely "The most of the best to the greatest number of people for the least." 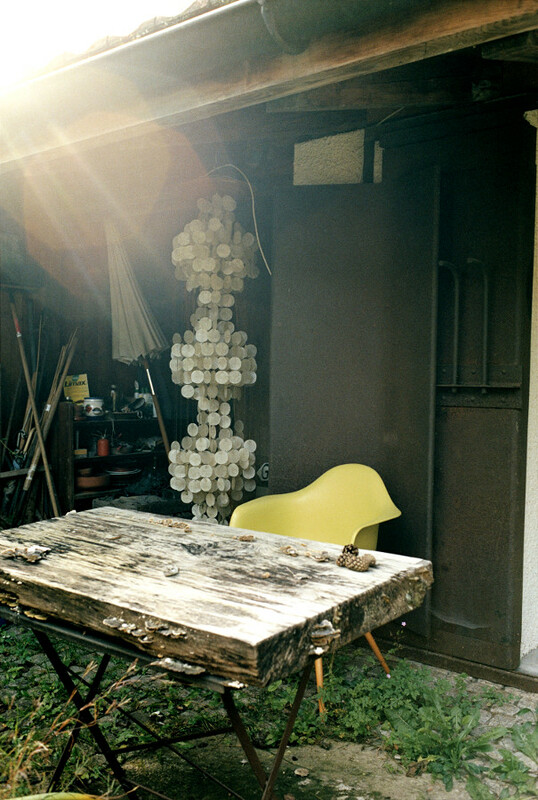 Initially the Eames Plastic Chairs were made of fibreglass reinforced polyester resin. In the 1940s and 1950s the material was considered revolutionary as it provided a hitherto not achievable flexible formability and had a very pleasant feel. It was also affordable for the masses. 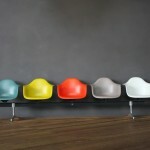 From the beginning of the 1940s Eames furniture in the U.S. was manufactured by Herman Miller. 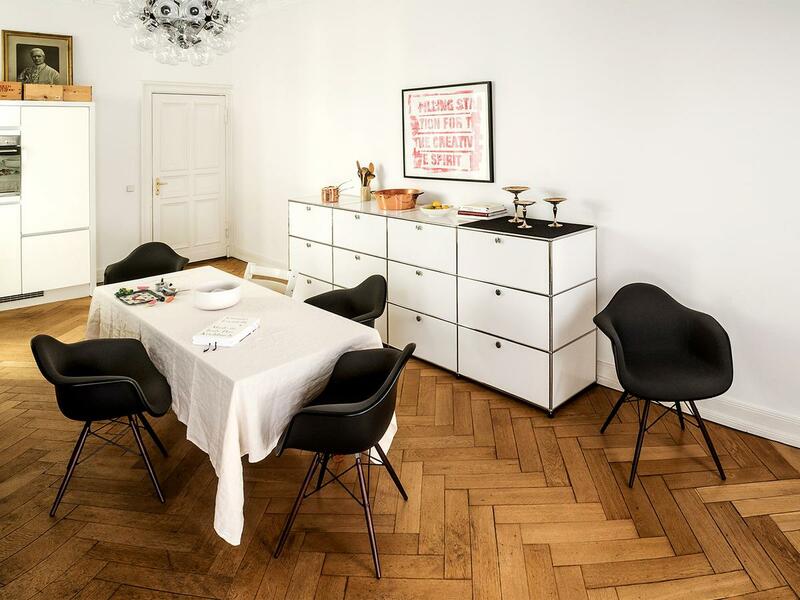 In the 1950s, Willi and Erika Fehlbaum, the founders of the then fledgling company Vitra, discovered the Eames chairs on a trip through the USA and quickly negotiated the licenses to produce Eames designs in Europe and Asia. 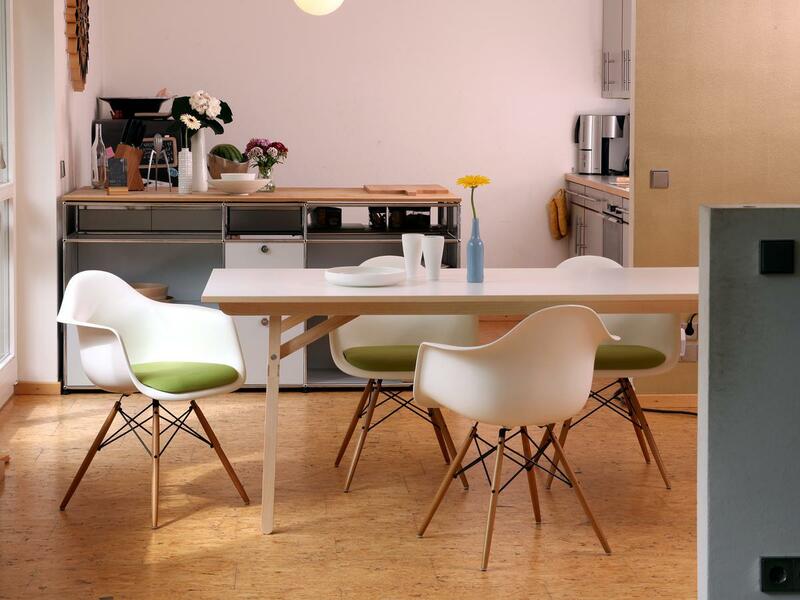 In 1993 however the production of Eames Armchairs and Side Chairs was halted: for Vitra the continued use of fibreglass for the Eames chairs was no longer considered environmentally justifiable. Fortunately in 1999 a new material was found and the production was resumed. Polypropylene could be just as easily formed as fibreglass, was and is however recyclable. 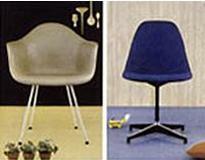 In America Herman Miller also switched production of the Eames Chairs to polypropylene. It is perhaps not so far from the truth to say that the unique relationship between Charles and Ray Eames contributed to what made, and makes, their designs so special. 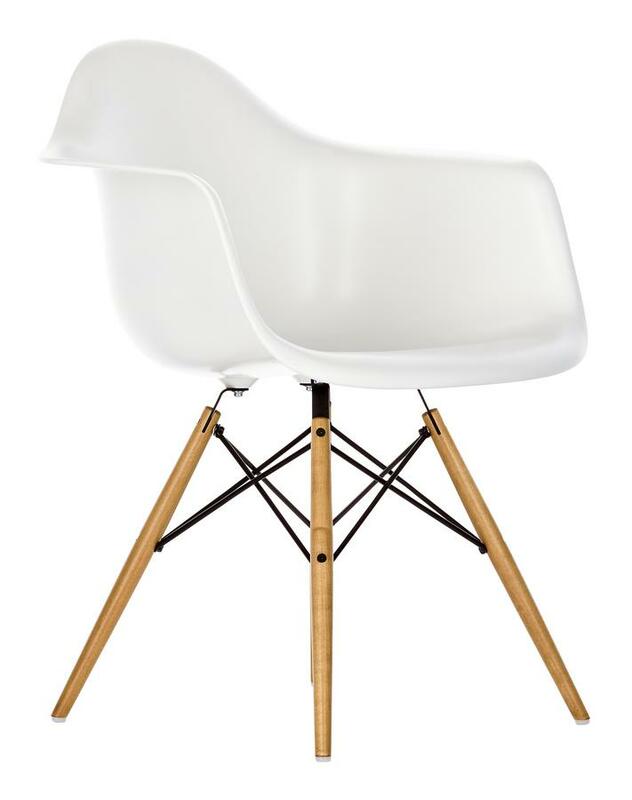 Charles Eames was born in 1907 in St. Louis, Ray Kaiser in 1912 in Sacramento. The pair met in 1940 at the Cranbrook Academy of Art where Charles Eames and Eero Saarinen we working on the preparations for the MoMA New York's "Organic Furniture Competition" and the art student Ray Kaiser was appointed to assist them. The following year the two married and in the decades that followed developed an extensive portfolio of graphic designs, films, toys, textiles, photographs, architecture, and last but not least the famous furniture designs. 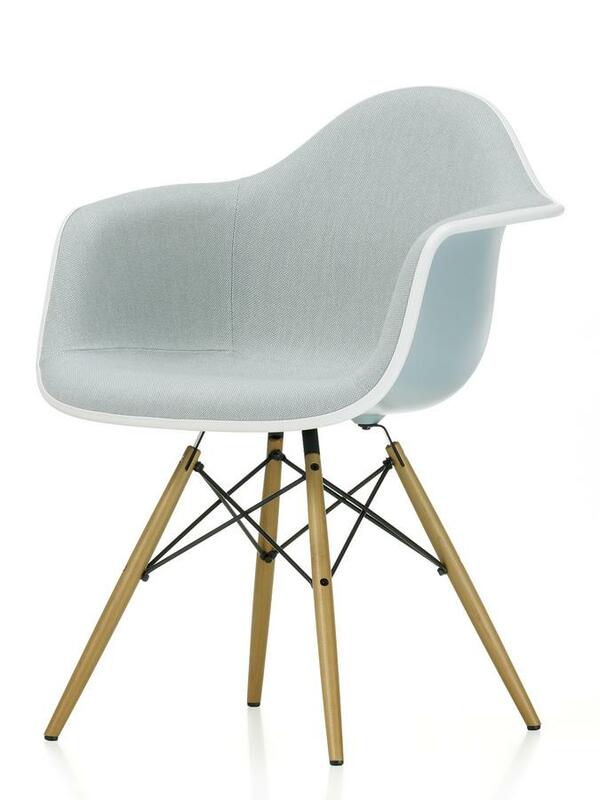 With their oeuvre Charles and Ray Eames significantly shaped mid-20th century modernism; for all in that they freed the domestic space from the clinical control of pre-war modernism, and instead ushered in a homely aesthetic and use-oriented furniture designs and accessories. 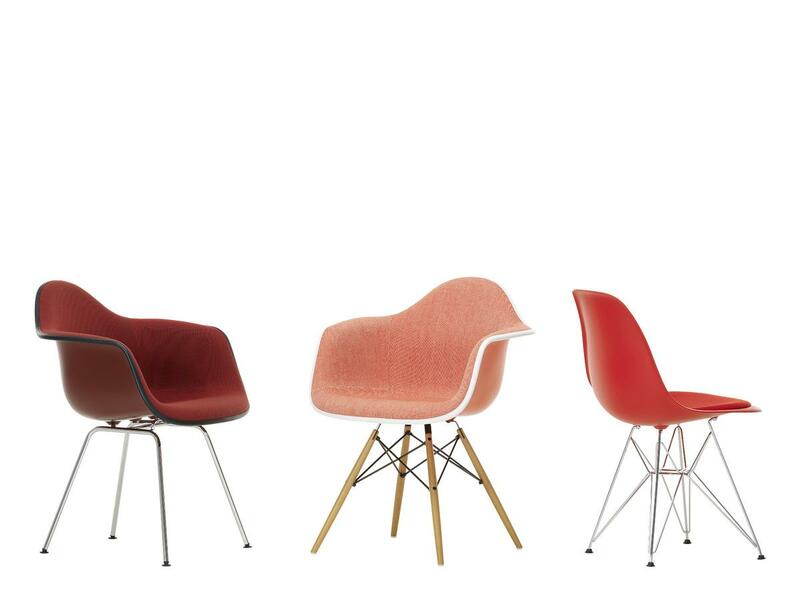 Of which the Eames chairs are fantastic examples. 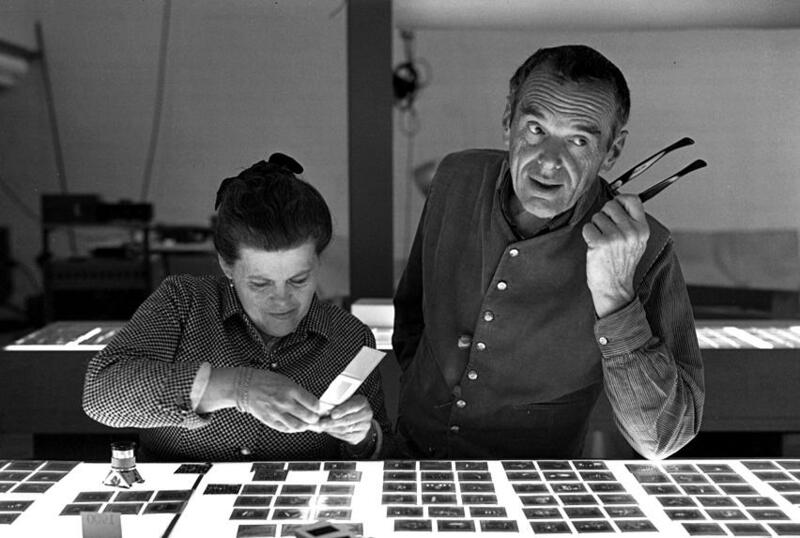 Charles Eames died on 21 August 1978, the next day Ray Eames closed the Eames Studio in Los Angeles. 10 years later, on August 21, 1988 Ray Eames died. For both Europe and the United States, the years after the Second World War were years of change. Change that led to new values. New requirements. new consumption. A new culture. 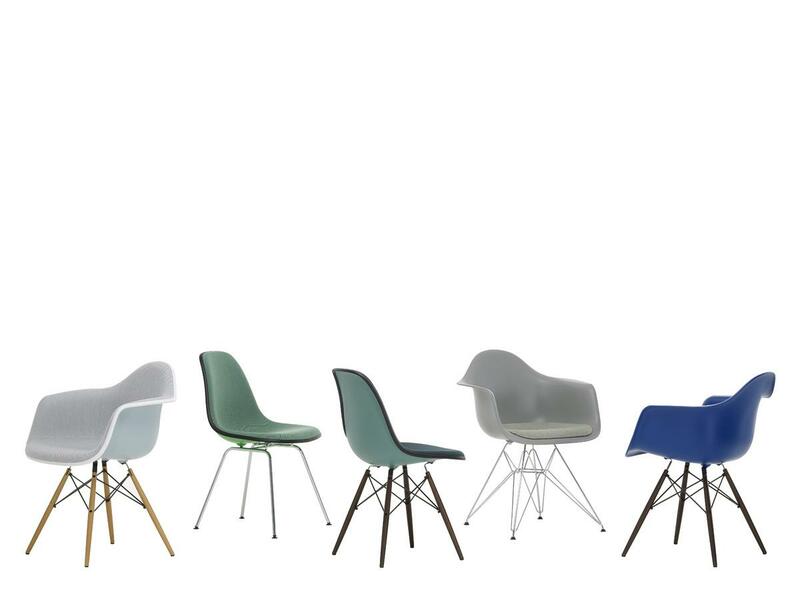 These new requirements were met head-on by Charles and Ray Eames with, amongst others projects, the DAW and the other members of the plastic chair family. A particular challenge of the period was the ever-increasing demand for housing and the rising prices per square meter. Facts which combined with the consequence that the average American living room was getting smaller. Furniture therefore had to be flexible and multi-functional. 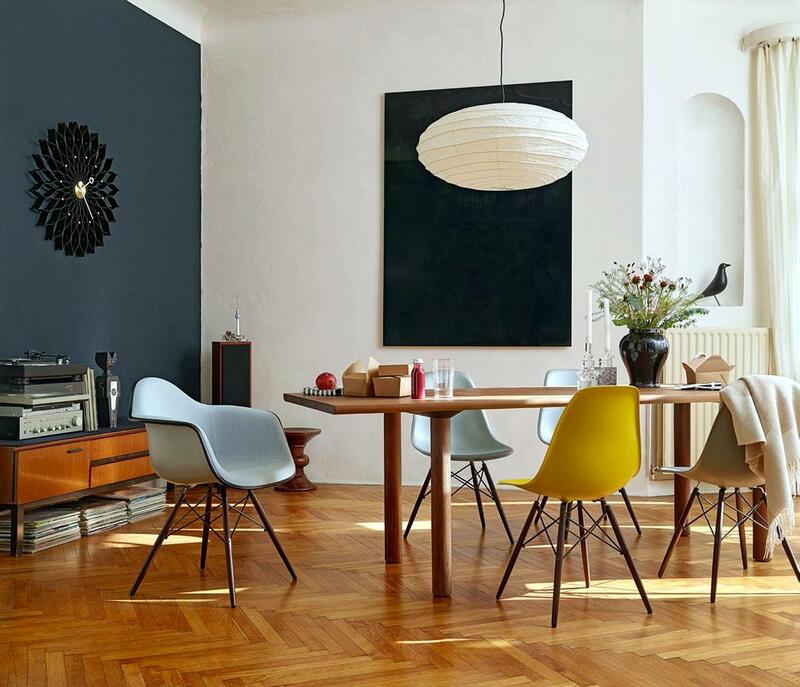 The Eames chairs achieved this partly because of the many possible combinations available, and partly due to their pleasing, versatile, design. 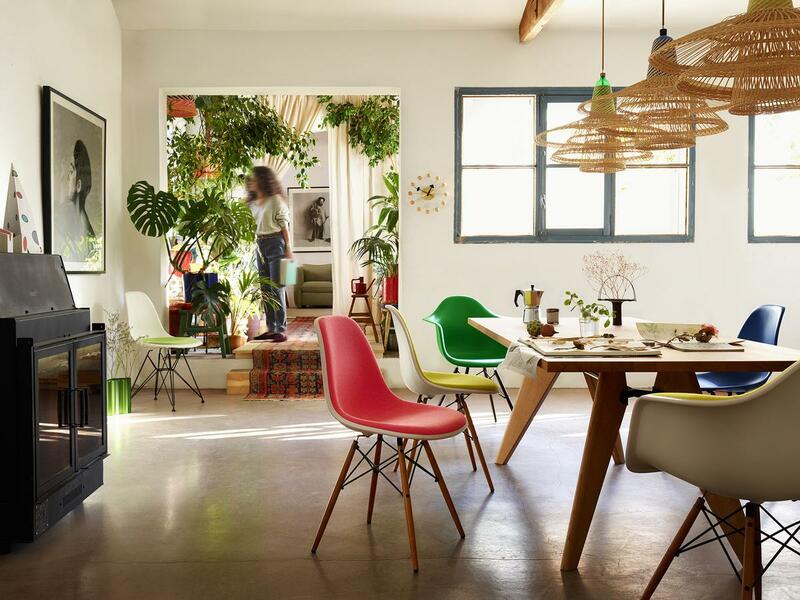 Since the 1940s the furniture designs of Charles and Ray Eames have been produced in the USA by Herman Miller. The history of their manufacture in Europe started in the early 1950s. 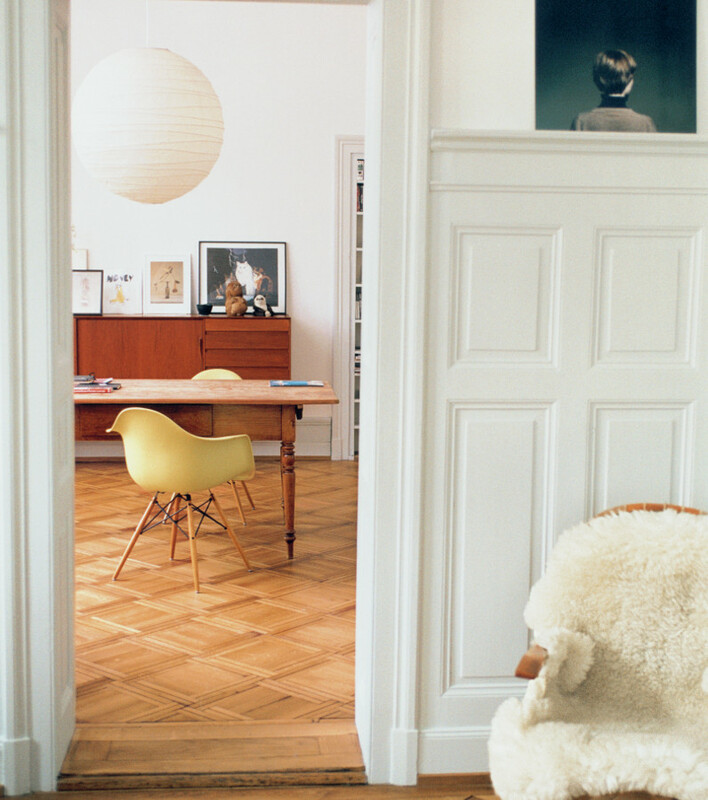 Willi and Erika Fehlbaum, owners of "Vitra", a small shop-fitter business in Basel, travelled to the United States where, by chance they saw an Eames chair in a shop window. Convinced of the potential of the designs they entered into negotiations over the license for European production rights. 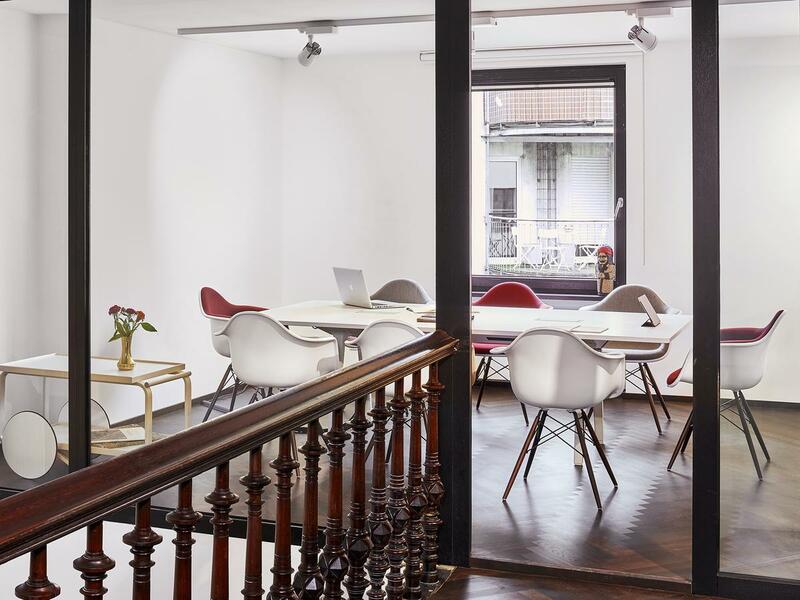 In 1959 they were awarded the licence and since then Vitra have had exclusive rights to manufacture Eames furniture in Europe and Asia. Between Charles and Ray Eames and Vitra there always existed a very close connection and even to this day problems at Vitra are approached with the question, "What would you say Charles and Ray say?". 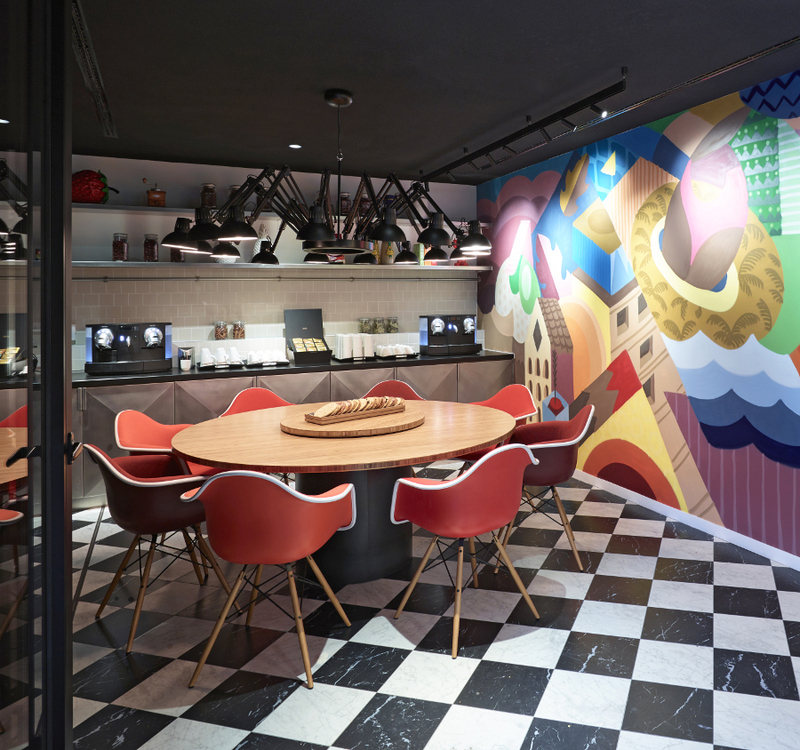 A further expression of the closeness of the connection is the fact that Vitra, and not the Eames family, took possession of the Eames archive upon Ray Eames' death. 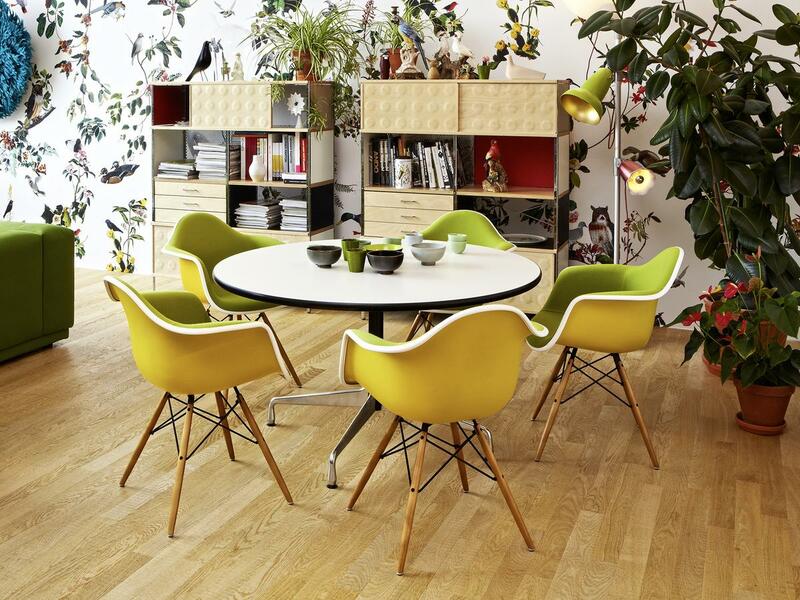 But Vitra's ambitions are by no means limited to the care of design classics. Just as important for the company are collaborations with young designers such as Hella Jongerius or Edward Barber & Jay Osgerby. In addition with the Vitra Campus, and in particular the Vitra Design Museum, Vitra are deeply involved in promotion of contemporary design, art and architecture.